Rachel Purkett, Digital Media Manager at Monitor talks about a recent crowdsourcing campaign that has helped to improve policy development in the organisation. At Monitor we recently concluded our second ever ‘crowdsourcing’ campaign. We used a new online platform to hold a conversation on driving quality and efficiency in mental health and community services. 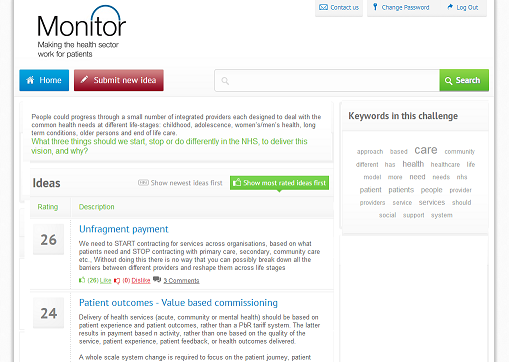 It is helping to guide how we and our colleagues at NHS England are developing the NHS payment system. Our reason for taking this new approach – which is becoming increasingly popular amongst our policy teams and external stakeholders – is that our pricing team needed to engage with and gather views from hundreds of health sector leaders in a very short space of time and with a minimal budget. There was no way that face to face events would be fast or inexpensive enough, or that a standard consultation would provoke the kind of open discussion we wanted. We had already been experimenting with crowdsourcing for an earlier piece of work, and believed it would be an effective way to get the results we wanted. The results we’ve had are very encouraging. During the two and a half week campaign, more than 100 sector leaders took the time to participate, collectively making more than 600 contributions to the discussion. "Participants were very candid, so we now have a significant number of very useful ideas and comments that are already helping us shape what the next steps of our work look like"
This engagement isn’t an end in itself – it’s going to lead to action. Our pricing team is using the ideas submitted to determine how best to support local health economies to increase quality and cost-effectiveness in community and mental health care in 2015/16. This could include setting rules or publishing guidance, and bringing together a range of tools that will help mental health and community commissioners and providers deliver better, more cost effective care for patients. Personally I was really excited to see the discussion gather pace and then take off as more and more people shared their thoughts. For me, this project was a perfect example of how policy teams and digital teams can work together in a way that benefits the sector.